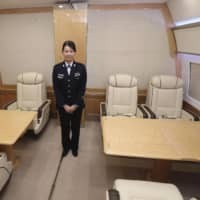 CHITOSE, HOKKAIDO - The Air Self-Defense Force unveiled on Thursday the inside of a new government plane at its base in Chitose, Hokkaido. The new jet, to be put into service from fiscal 2019 starting next April, will carry such dignitaries as the prime minister and members of the Imperial family. The aircraft, based on the Boeing 777-300E, is similar in size to the current government jet, which is modeled on the Boeing 747-400, and will even have Wi-Fi. Facilities shown to the media on Thursday included a space with 85 seats for journalists, a section with 21 seats for government officials and a conference room. The area that will be used by dignitaries, such as the prime minister and Imperial family members, was not shown for security reasons. 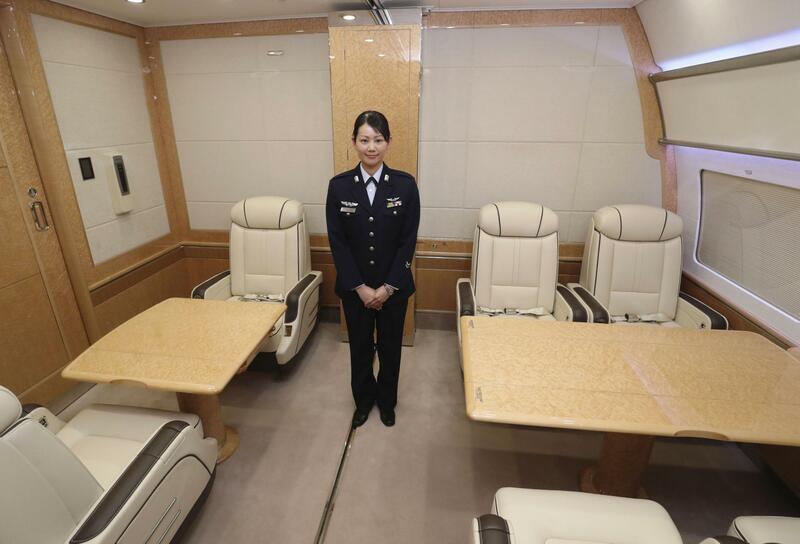 A special ASDF unit at the Chitose base will be in charge of operating the new plane. Maintenance work will be conducted by All Nippon Airways. The current government aircraft, which debuted in 1993, will be decommissioned next March.